1. Heat half the oil in a large frying pan, add bacon and cook, turning occasionally, until browned and cooked to your liking (3-4 minutes for semi-crisp). Drain on paper towels and keep warm. 2. Wipe pan with paper towels, add remaining oil, crack in eggs and cook over medium-high heat to your liking (3-4 minutes for soft yolks). 3. 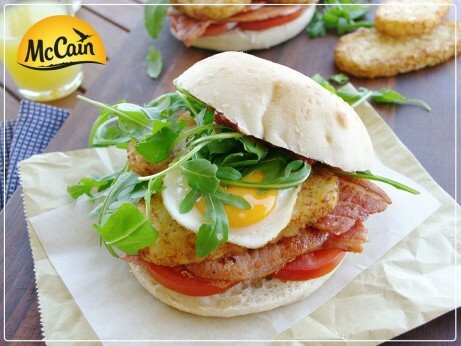 To serve, top Turkish roll with tomato, bacon, McCain Hash Brown, egg, rocket and a dollop of tomato relish. Season to taste, add roll top, and serve hot. 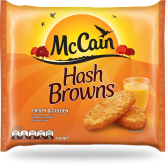 1 Heat half the oil in a large frying pan, add bacon and cook, turning occasionally, until browned and cooked to your liking (3-4 minutes for semi-crisp). Drain on paper towels and keep warm. 2 Wipe pan with paper towels, add remaining oil, crack in eggs and cook over medium-high heat to your liking (3-4 minutes for soft yolks). 3 To serve, top Turkish roll with tomato, bacon, McCain Hash Brown, egg, rocket and a dollop of tomato relish. Season to taste, add roll top, and serve hot.